Have your SQL code formatted automatically, based on flexible user-defined code styles. Don’t spend time formatting legacy code—let DataGrip do it for you with a single shortcut Ctrl+Alt+L! Adjust code style in Settings → Editor → Code Style → SQL where you can define if you capitalize keywords or not for example. Multiple cursors are often the most efficient way to modify SQL code. To do this in DataGrip, press Alt twice and hold it, then place new cursors with the arrow keys. Or, hold Shift+Altand click to do the same. Or, use text search first and then place multiple cursors in all the places where matches have been found by choosing Select All Occurrences to the right of the search text field. Use built-in live templates to generate repetitive parts of SQL code, and create custom templates for even greater efficiency. Press Ctrl+J to see all the Live Templates. Each console has Local History so you will never lose your code. DataGrip tracks the changes made to your source files, protecting you from any accidental losses or modifications, even if they were made by other applications. Whenever you want to, you can inspect the history of a particular file or directory. Compare changes in the Diff Viewer and revert to the version you need. With DataGrip you can access your clipboard history and quickly paste any of the recent items copied to the clipboard. DataGrip starts recording copied items to its clipboard history as soon as you start the application and clears the history when you close it. To invoke this, press Ctrl+Shift+V. Go to Settings → Editor → General → Limits to define how many clipboard copies are stored. Press Ctrl+W to run syntax-aware selection. First it will select the word under the caret. Press it again, and the selection will expand in a smart way as DataGrip analyzes the code being edited. This is the quickest way to select a particular clause or sub-query. To go in reverse, press Ctrl+Shift+W and the current selection will shrink. In every editor, whether it is a data editor or query console, DataGrip checks the spelling of words — for the green wavy underlines view, the dictionary suggestions using Alt+Enter → Typo: change to.... It even works for words written in camelCase! Instead of doing all this copy-paste stuff for moving the blocks of code about, use the features of the editor. Duplicate the line by pressing Ctrl+D, delete the line with Ctrl+Y and move the line with Ctrl+Shift+Arrow Keys. All these hotkeys can be used for managing selected blocks of code as well. This feature lets you treat string literals as live code written in other languages (like XML, JSON, any SQL dialect or regular expressions), including formatting, highlighting, usage search, completion, and even refactoring. Language is auto-injected into a literal when DataGrip understands the type of the string inside. 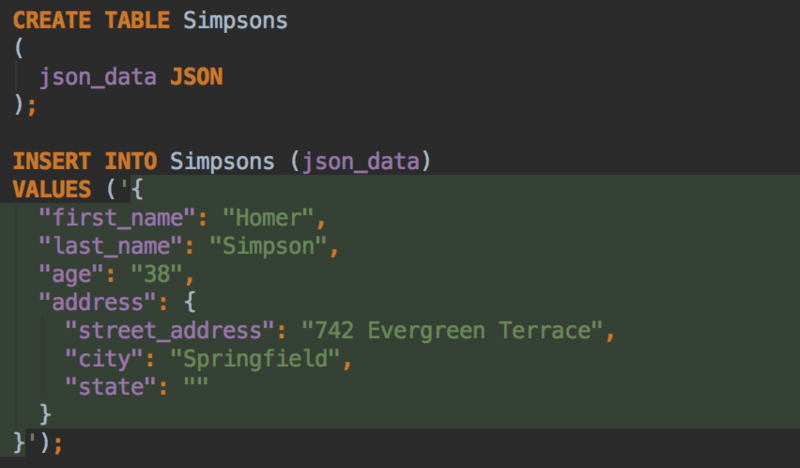 For example, if you are working with values from JSON columns, they will be treated as such. By default, there are only two predefined injection types: JSON and XML. However, it’s really simple to create your own injections: just press Alt+Enter and then select Inject By Type. If you want to have the injection whenever you edit a particular piece of code, comment it with “language=” like in the screenshot. In it is another important example of language injection — the use of Dynamic SQL that provides coding assistance for the injected fragment. Manage your code by toggling comments. 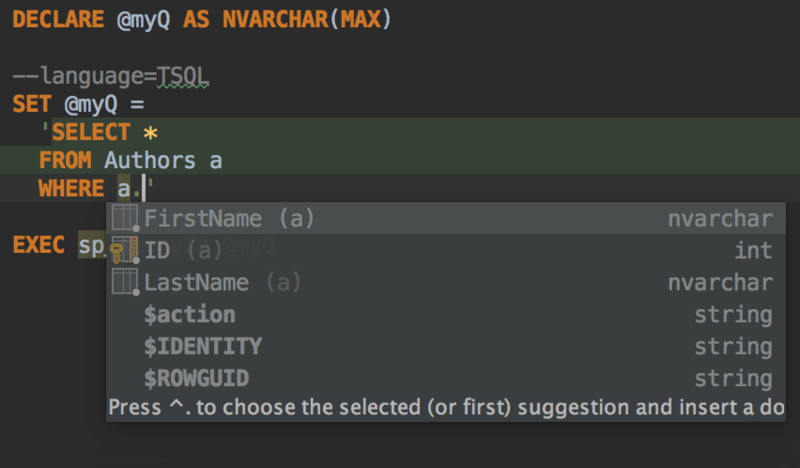 Choose what type of comments you want to use—block or line-by-line (if it's supported by your SQL dialect).